I smelled the reek of failure all day today. 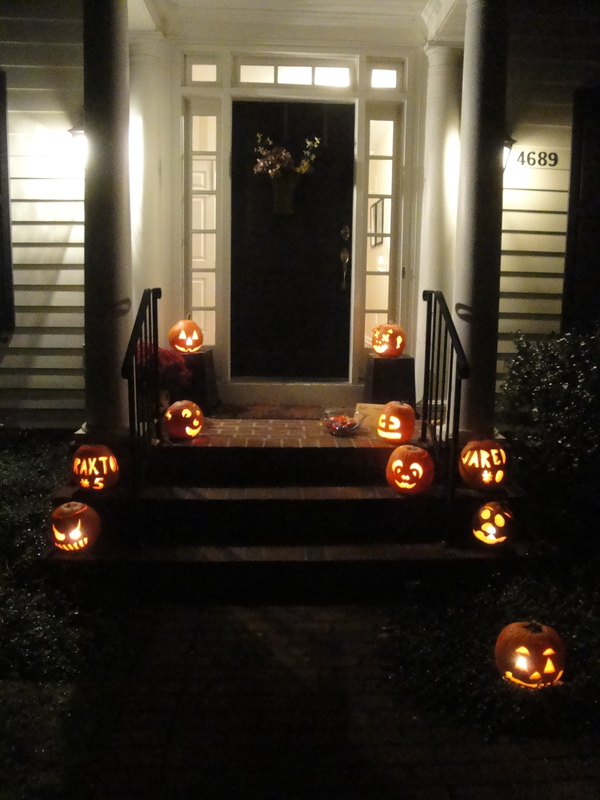 Because the weather has been so foul, we utterly failed to carve our pumpkins into jack o’ lanterns and then convert the front entrance to our home into the traditional Webner House Beggars’ Night pumpkin walk. 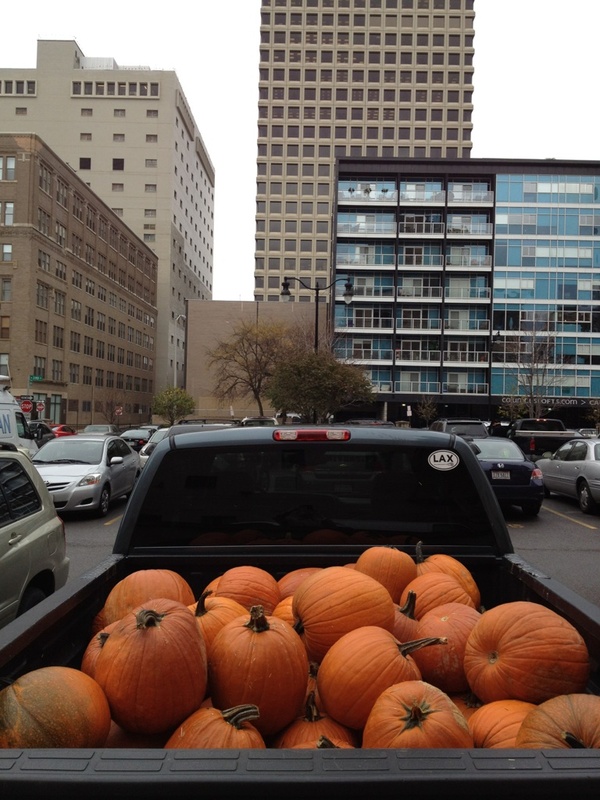 When I walked out of our downtown Columbus offices today for lunch meeting, however, my spirits were lifted when I saw a pickup truck filled with pumpkins parked in the lot next door. At least the driver of that truck, I thought, is properly keeping the pumpkin spirit alive — even if we at Webner House have failed abysmally. We had our traditional Halloween Jack ‘o Lantern entryway this year. It features 10 carved pumpkins, including tributes to Braxton Miller and Jared Sullinger and attempts to carve scary, silly, goofy, and happy pumpkin faces. It think it’s a pretty good crop. Thanks to our neighbors, the Taylors, for their excellent help with the pumpkin carving this year! Tomorrow is Beggars’ Night, so today was our pumpkin-carving day. This year, we had 10 pumpkins to be gutted, carved, and made ready to be implanted with candles and placed on our walkway to light the way for trick-or-treaters. I love carving pumpkins. I like doing the emptying and carving the day before, so that the pumpkins can dry out before the big evening. I love getting ready for it, and laying out the carving implements like a scrub nurse placing the surgical instruments on trays in preparation for an operation. Pumpkin-carving is an occasion that demands proper tools. 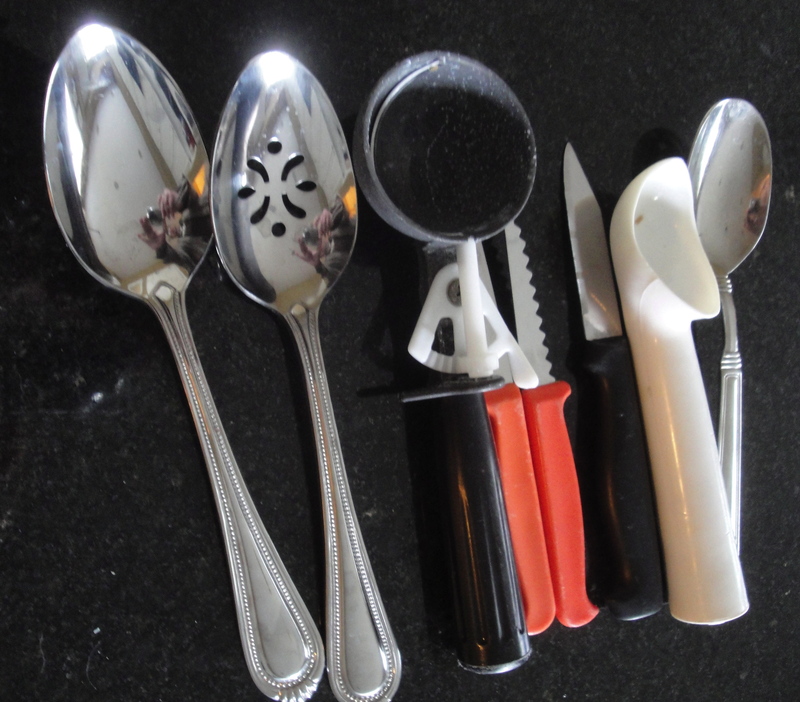 Our implements include a plastic ice cream scoop, knives, shallow spoons, and two excellent pumpkin carving tools that are blunt but with serrated blades — perfect for puncturing the tough orange skin of the pumpkin and then slicing, safely, through the pumpkin flesh. I especially like the tactile sensation of pumpkin carving. It seems basic and ancient, somehow, like skinning a rabbit, whittling a stick, churning butter, or performing another chore that would be done on the frontier. You cut carefully around the stem, slicing horizontally to avoid the possibility of the pumpkin lid falling into the interior. You feel the resistance yield and hear a satisfying tearing sound as you slowly pull the top, heretofore bound like Gulliver by the tiny threads of pumpkin innards, free from the rest of the pumpkin. 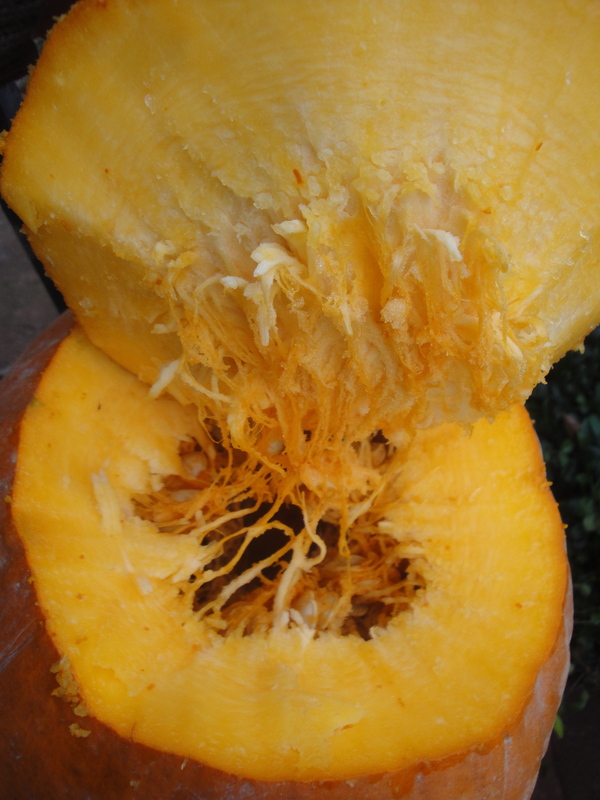 You look inside, and see the slimy strings and goop and seeds and smell that heady, rich pumpkin smell. You know that your hands will be smeared orange and covered with flecks of pumpkin, because emptying the gut is something that requires you to use your hands, grip the spaghetti-like strands, and yank them out. Our plastic ice cream scoop is exceptionally well-suited to scraping the insides of pumpkins until they are free of the wet threads and seeds. (This year, we contributed the seeds to our neighbor, who will bake and salt them and use them for snacks.) 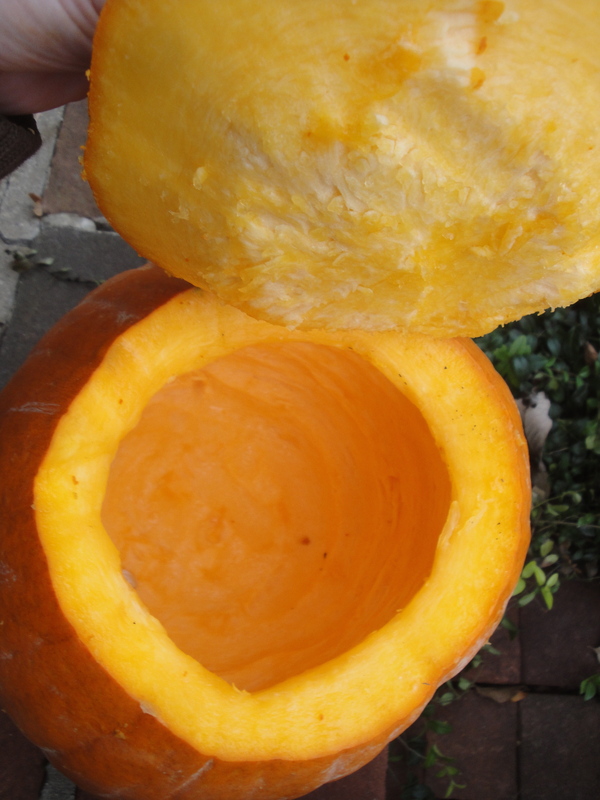 I like to scour the inside walls thoroughly, so that the interiors of the hollowed-out pumpkins are as smooth as a baby’s behind. That allows the pumpkins to dry overnight and makes them better suited for candle placement and candle lighting and burning. And if your interior pumpkin walls are thinned by vigorous scraping, the candlelight will give your pumpkin a cool-looking, eerie inner glow on Beggars’ Night. After the preparation comes carving time — when all creativity can be loosed, and the pumpkin can become a temporary, soon-to-be-discarded testament to your artistic sensibilities. I’ll share some pictures of our jack-o-lanterns, and our pumpkin walkway, when they are lit and on display tomorrow night. I like carving pumpkins. Hey, I even like hollowing out pumpkins, using a big spoon to scoop out the gunk and seeds and stringy wet orange threads, and then scraping the insides until they are dry and white. When you prepare a pumpkin correctly and scrape it out thoroughly, the resulting carved jack ‘o lantern will glow with a very satisfying inner light when a candle is placed inside and lit. This year we did our carving Wednesday night, with the help of our neighbors, Dave and Amy Taylor and their daughters, Grace and Jane — as well as a host of other neighborhood kids. We have some good carving implements that are serrated but not sharp. They are perfect for kids to use in carving the soft tissue of a ripe pumpkin. All of the kids got to carve a pumpkin or two and let their creative juices flow, and even Dave and Amy got into the act. I carved two jack ‘o lanterns myself. Why not? How often do any of us get to do something even mildly artistic? This year Kish got an interesting selection of pumpkins — some were your standard pumpkins, but there were a number that were almost like gourds, with thick skins and warty, pebbled surfaces that were not easy to carve. Still, they spurred your imagination, as you thought about how to incorporate the warts and raised surfaces into your finished product. After we were done, I set the pumpkins out to dry. The next night was trick or treat night in New Albany, and we filled the jack ‘o lanterns with votive candles, lit them, and placed them by our door, on our stoop, and along the pathway to our door. We ended up with a pretty impressive pumpkin walk that garnered a few compliments from our visitors. The most recent consumer confidence survey was discouraging, but if spending for Halloween is any kind of indicator, people may be becoming more bullish. Tonight is Trick or Treat night in New Albany, and our neighborhood is festooned with fake spider webbing, scarecrows, styrofoam tombstones, hanging bats, skeletons emerging from the ground, and screaming skulls. If the weather cooperates — and it is supposed to — it should be a fun night for the kids. 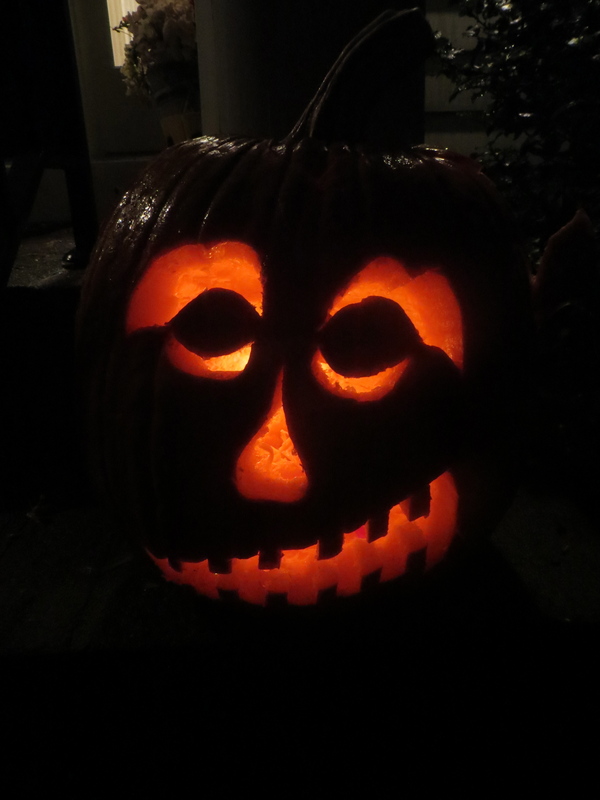 Last night we had some neighborhood kids over and carved pumpkins for the Webner house jack ‘o lantern walk. We’ve got about 12 carved pumpkins and we will position them on the walk to the front door, for a lighted path for our trick or treaters. I’m hoping to get and post some photos of our pumpkin artwork.